Eclipse JFace TreeViewer tutorial. 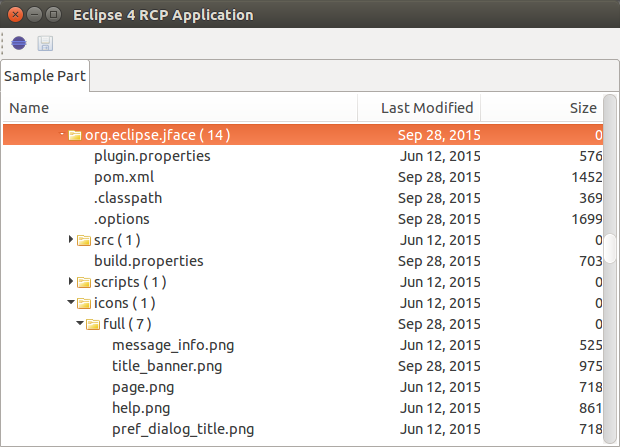 This tutorial explains the usage of Eclipse JFace TreeViewer. It also shows the usage of a DelegatingStyledCellLabelProvider. It is based on Eclipse 4.4. (Luna). For an example on how to build JFace Tables please see JFace Table Tutorial. The TreeViewer class provides viewer support for displaying trees. The usage of this class is similar to the TableViewer class. The main difference is that the TreeViewer class requires a structured content provider. Typically your content provider has to implement the ITreeContentProvider interface to be used with your TreeViewer class. This ITreeContentProvider just delegates to the ArrayContentProvider in its getElements method and the elements have no children. JFace allows you to access the SWT controls to define listeners on your viewer. For example you can add a SelectionListener implementation to the SWT control which is wrapped in the JFace object. The following code snippet demonstrates how to expand a tree with a mouse click. Viewers allows you to add certain listeners directly to them. The following example shows how to expand an instance of a TreeViewer with a double click. In case a TreeViewer has multiple columns it does not look good, if the first column, which contains the expandable items is clipped. In order to let a column fit to it’s contents width you can invoke the columns pack method like that. With this code every column of the Tree will have the appropriate width, when a TreeItem is expaned, so that the contents of the column is not clipped. The font size can be increased by simply setting a Font for the underlying SWT Tree. This exercise is a stand-alone exercise and can be used to repeat the steps of creating an Eclipse 4 application. Download or create an icon called folder.png and place it into the "icons" folder of your plug-in. This icon is taken from the FamFamFam silk icons collection and is licensed under the Creative Commons Attribution 2.5 License. Add a part stack with a part to your application model and display a TreeViewer in this part. Implement a class for the ITreeContentProvider interface which allows you to browse the file system. Review the Javadoc of this class to understand the methods of this interface. Also implement your custom LabelProvider for the tree. Use viewer.setInput(File.listRoots()); to set the initial input to the viewer. The following listing contains an example implementation for this exercise. It assumes that you added the "folder.png" icon to the "icons" folder. It also demonstrates the usage of a ViewLabelProvider. Link from your part in the application model to your new class. Start your new application ensure that you see the content of your file system in your tree. This exercise assumes that Optional Exercise: File browser via a TreeViewer has been done, since this exercise is based on it. To add multiple columns in a TreeViewer, the TreeViewerColumn class can be used to define columns for the underlying tree. A TreeViewerColumn itself is a wrapper around the TreeColumn widget from SWT. Instead of applying a CellLabelProvider for the whole viewer each TreeViewerColumn gets its own CellLabelProvider assigned. This allows that label for each column can be defined separately. To assign a label provider to the tree viewer column the TreeViewerColumn#setLabelProvider method is used. This example shows how to make a JFace TreeViewer searchable. Pressing Ctrl-f opens a search dialog. If a tree item is found it gets selected.